Africa is the world's second largest continent, encompassing an area of 11,677,240 square miles (30,244,051 square kilometers), including offshore islands. Recognized as the birthplace of the human race and of many other animal and plant species, it also possesses the world's richest and most concentrated deposits of minerals such as gold, diamonds, uranium, chromium, cobalt, and platinum. 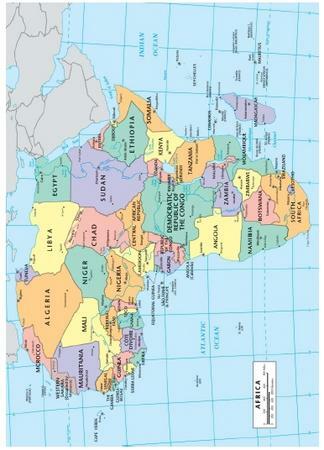 Geologically, Africa is 3.8 billion years old (Earth is 4.6 billion years old). Present-day Africa, occupying one-fifth of Earth's land surface, is the central remnant of the ancient southern supercontinent called Gondwanaland, a landmass once made up of South America, Australia, Antarctica, India, and Africa. This massive supercontinent broke apart between 195 million and 135 million years ago, split by the same geological forces—continental drifting, earthquakes, volcanos—that continue to transform Earth's crust today. Africa has fewer high peaks than any other continent and few extensive mountain ranges. The major ranges are the Atlas Mountains along the northwest coast and the Drakensberg Mountains in South Africa. 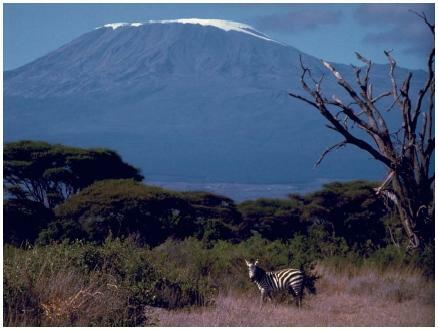 The highest point on the continent is Kibo (19,340 feet/5,895 meters), a peak of Mount Kilimanjaro in northeast Tanzania. Despite its location near the equator, the peak is permanently snowcapped. Geologists characterize Africa's topography (physical features) as a collection of swells and basins. Swells are layers of rock warped upward by Earth's internal heat and pressure. Basins are broad, lower-lying areas between swells. The continent can be visualized as an uneven tilted plateau, one that slants down toward the north and east. The swells are highest in East and central West Africa, where they are capped by volcanic flows originating from the Great Rift Valley. The most distinctive and dramatic geological feature in Africa is the Great Rift Valley. The rift opened up approximately 65 million years ago, shortly after the dinosaurs became extinct. It extends almost 3,000 miles (4,830 kilometers) from northern Syria down the eastern side of the African continent to central Mozambique. The ranges in elevation of the valley are great, from about 1,300 feet (395 meters) below sea level at the Dead Sea to over 6,000 feet (1,830 meters) above sea level in southern Kenya. The Great Rift Valley has a western branch that begins north of Lake Albert (Lake Mobutu) along the Zaire-Uganda border. It then curves south along Zaire's eastern border, forming that country's boundary with Burundi. This branch is punctuated by a string of lakes, the deepest being Lake Tanganyika (on the boundary between Tanzania and Zaire), with a maximum depth of 4,710 feet (1,436 meters). The rift valley is alive seismically, with much earthquake-related activity occurring. About once a decade lava flows and volcanic eruptions take place in the Virunga mountain range on the Zaire-Uganda border. The main or eastern branch of the rift valley experiences more volcanic and seismic activity than the western branch. Geologists consider the geological forces driving the main branch to be those associated with the origin of the entire rift valley and deem the main branch to be the older of the two. Hominids, or human ancestors, arose in the Great Rift Valley. Paleontologists, scientists who study fossil remains, have unearthed in Ethiopia and Tanzania hominid fossils that have been dated from three to four million years old. Hominid remains have also been found in Morocco, Algeria, and Chad. Mount Cameroon, which stands 13,350 feet (4,005 meters), and a few smaller neighboring volcanos in Cameroon on the Gulf of Guinea are the only active volcanos on the African mainland outside of the Great Rift Valley. However, extinct volcanos and evidence of their activity are widespread on the continent. The Ahaggar Mountains in the central Sahara Desert contain more than 300 volcanic necks, massive vertical columns of volcanic rock, that rise 1,000 feet (305 meters) or more. Also in the central Sahara, several hundred miles to the east in the Tibesti Mountains, there exist huge volcanic craters or calderas. In the Great Rift Valley, the Ngorongoro Crater in Tanzania, surrounded by teeming wildlife and spectacular scenery, is a popular tourist attraction. Volcanism formed the diamonds found in South Africa and Zaire. The Kimberly diamond mine in South Africa is actually an ancient volcanic neck. Between 1,600,000 and 11,000 years ago, the Sahara was subjected to humid and then to arid (dry) phases, causing it to spread into adjacent forests and green areas. About 5,000 to 6,000 years ago, further humid and arid phases promoted desertification (the transformation of arid or semiarid land into desert) in the Sahara as well as the Kalahari in southern Africa. Earth scientists say the expansion of the Sahara is still occurring today, with the desertification of farm and grazing land responsible for the spread of famine in the Sahel or Saharan region. Basins: Broad, lower-lying areas between swells. Deforestation: Total clearing of trees and other plants from forest areas. Gondwanaland: Ancient supercontinent that was made up of present-day Africa, South America, Australia, Antarctica, and India. Swells: Layers of rock warped upward by Earth's internal heat and pressure. Volcanic neck: A massive vertical column of volcanic rock, formed in the vent of a volcano, that has been exposed by erosion of the flanks of the volcano. Africa holds the world's richest concentration of minerals and gems. In South Africa, the two-billion-year-old Bushveld Complex, one of Earth's largest masses of igneous rock (cooled and hardened molten rock), contains major deposits of metals such as platinum, chromium, and vanadium. These metals are indispensable in toolmaking and high-tech industrial processes. Almost all of the world's chromium reserves are found in Africa. Chromium is used to harden alloys (metal mixtures), to produce stainless steels, and to provide resistance to corrosion. As for other minerals, one-half of the world's cobalt is in Zaire. Onequarter of the world's aluminum ore is found in a coastal belt of West Africa stretching 1,200 miles (1,920 kilometers) from Guinea to Togo, with the largest reserves in Guinea. Uranium deposits are found in South Africa, Niger, Gabon, Zaire, and Namibia. South Africa alone contains one-half the world's gold reserves. Mineral deposits of gold are also found in Zimbabwe, Zaire, and Ghana. the world's diamond reserves, which are located in South Africa, Botswana, Namibia, Angola, and Zaire. Major coal deposits exist across northern and southern Africa and in the central African countries of Zaire and Nigeria. Petroleum reserves are high in northern Africa, particularly in Libya, Algeria, Egypt, and Tunisia. Nigeria is the biggest petroleum producer in West Africa, followed by Cameroon, Gabon, and the Congo. Angola contains the chief petroleum reserves in southern Africa. The impact of humankind upon the African environment has been far-reaching and undeniable. Beginning 2,000 years ago and accelerating to the present day, belts of African woodlands have been cleared of trees and other forest plants, a process known as deforestation. Such environmental destruction has been worsened by the overgrazing of animals and other agricultural abuses. Human-made climate changes, including possible global warming caused by the buildup of human-made carbon dioxide, chlorofluorocarbons (CFCs), and other greenhouse gases, have also damaged the environment. Deforestation, desertification, and soil erosion pose threats to Africa's artificial lakes and, thereby, the continent's hydroelectric capacity, or ability to produce electricity with water power. Africa has limited water resources, and its multiplying and undernourished populations exert ever-greater demands on farmland that has to be irrigated. Many earth scientists say using more environmentally friendly farming techniques and practicing population control are vital to stabilizing Africa's ecology and protecting its resources and mineral wealth. This was very useful especially the part about the Great Rift Valley, mainly because this is what I had to do a presentation on. Thank you very much and don't worry we cited our sources. Good luck to your cite and it was the best source ive had so far. Thumbs up to the crew. I would love to know which country Zaire is located. im doing a science project on the great rift valley of tanzania, and i am having lots of problems finding the answers to this question, i was wondering if you could PLEEEAASSEEE help me out? !